We stayed here as a party of 14. Was a great hostel, comfy and clean beds. Fabulous location. The reception staff were very helpful. Would definitely stay here again. I cannot complain. 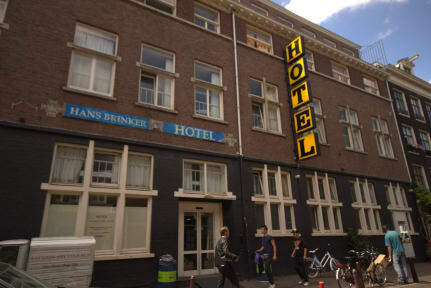 It has everything required for a trip to Amsterdam: perfect location, good atmosphere, nice breakfast, 24h checkin, etc. The beds are super comfy, the location is great, and the staff is a great resource. I had a great stay at Hans Brinker Hostel. The only downfall is that the bathrooms get very wet after people shower and was slightly messy. However, other than that it was a wonderful stay. Hostel is near to tram station. Hardly 4 stop frm central station. Restaurants are nearby which are open till 3 AM. Staff are very helpful. It provide free blanket, pillow, towel and a big spacious lockers. It has its own pub,cash kiosk, etc. Overall very good experience. Nice place for a quick trip - do not expect to sleep well in the heart of Amsterdam! No tips or recommendations from the reception desk, bathroom was ultra-small with a barely functioning shower. The location is decent, close to Rijksmuseum, but quite far from the central areas. Basic breakfast, a rather rude staff in the kitchen. My experience was just about ok. The location is really good in between a bunch of smoke shops and restaurants but it was super dirty, to the point where I was uncomfy in my room and I’m pretty tolerant about mess. It’s super cheap for Amsterdam but you def get what you pay for and there are super nice ones around that are $10 more and much cleaner and friendlier.